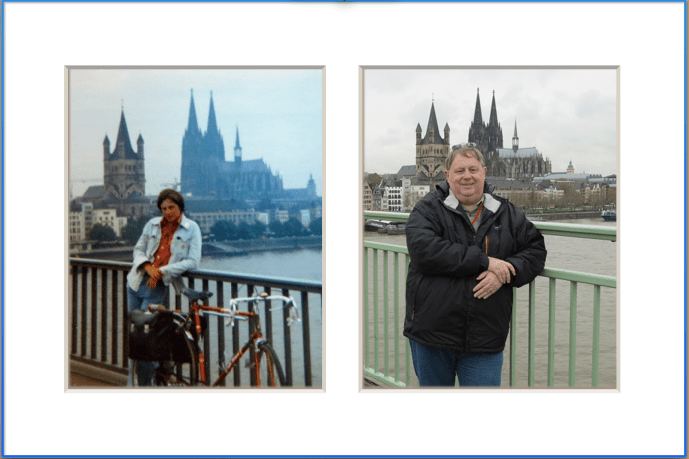 Age span: Standing on a Cologne bridge with the cathedral in the background at ages 17 and 53. I can’t pull off the same broody teenage pose now! So began the diary I wrote 37 years ago as a teenager about the trip my schoolfriend Chris Moran and I took in Germany, from Cologne to Karlsruhe. We transported our two cycles by train from Epsom in Surrey, where we lived, to Dover, ferry to Ostend in Belgium, then by another train to Cologne. My luggage consisted of two bicycle panniers filled with two shirts, a couple of T-shirts, two pairs of shoes, spares and tools for the bikes – and two pairs of underpants. In those days I kept a very detailed diary, which for this trip extended to 180 closely written pages. Despite my inherent hyperbole, this was quite an adventure for us. We studied German together but were far from proficient. I was used to cycling long distances then but our stamina and good temper was to be tested to the limit. We ended up late at night, exhausted, wet and with nowhere to sleep; we nearly ran out of money and food; we took a wrong turn on to a deadly autobahn; I attracted a worried crowd when I went swimming in the Neckar and, after musing about never going home, we nearly missed our train back to England. For younger readers, it might be worth recalling this was long before the days of mobile phones, internet, texts and other helpful devices to keep in touch with home. Once we arrived in Germany – which was then still divided between the capitalist West and communist East – we were very much on our own, sending just the occasional postcard home. It was also years before cash machines, digital cameras and satnavs, so we had to rely on travellers’ cheques, rolls of 36-shot film that had to be developed later (the results were inevitably disappointing) and old-fashioned maps. We generally survived on bratwurst from cafes, rolls and cheese from supermarkets, and indistinguishable meat from youth hostels. A few months ago I retraced some of my journey along the Rhine on a Viking river cruise from Basel to Amsterdam with my wife, Mandy. We travelled much of the same route, albeit in reverse. With the help of my diary, I recalled and even revisited some of the places I first saw at 17, though without some of the scarier or riskier adventures! 2013: I again visited the cathedral – this time with Mandy – ate cake at a corner restaurant and went for a pub crawl drinking kölsch before returning to our Viking longship. 1977: Our longest day. Having cycled 80 miles, our final stretch to the youth hostel was a steep climb up to the fortress overlooking the city. In pitch darkness, and exhausted, we were unable to find the hostel and instead entertained thoughts of sleeping in woods or some houses that were being built. Finally, we found a small hotel where the welcome consisted of a wild barking dog. We booked a double room for the night and eventually found the hostel the other side of the fortress the next morning. We took a cable car and visited the Dutches Eck monument. 2013: Staying close to river level, I revisited the Eck and we walked into the historic town. 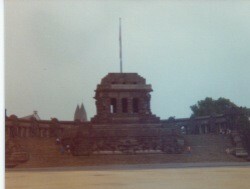 …while in 2013 there was an imposing statue. Had it been sent for cleaning while I was there last? 1977: We stopped to climb the rock, near St Goarshausen, where the mythical siren is said to have lured sailors to their death in the past. Even then, as a teenager, I had a pretty accurate idea of what life would have in store: ‘Though I slightly abused the number of coaches and hordes of tourists conveyed by them, I told Chris that I thought this would be the way I would travel in my retirement’. However, I very nearly never saw that future, as on leaving the Lorelei, I forgot I was abroad and swiftly turned on to the left lane of the road – only to find a lorry bearing down on me. Fortunately, I was able to get out of its way in time! 2013: We sailed past the Lorelei rock on Viking Jarl though, no doubt, we would have taken an excursion by coach there if we could! 1977: ‘It was so tempting to spend all day just looking into the meditative river… our east bank route gave us ample opportunity to see the numerous castles on the west, radiant in their glory’. Then later: ‘That day, the Rhine was blue. Rüdesheim, due mainly to its church tower, looked oriental in the bright sun.’ We spent much of one afternoon trying to track down a laundrette, which we eventually found in someone’s back garden! 2013: Having moored near the centre of town, we strolled to a bar where we enjoyed local wine and a Rüdesheimer coffee. We hired a rowing boat, which was probably not a good idea: ‘I do not believe Chris treated it seriously when I said I was going for a swim. The pants I was wearing were the most unlike swimming trunks I could imagine, but there was nothing for it – my mind was decided. Chris, who watched me like a suicide case, could not help smirking in spite of himself, but solemnity overcame him once more when I was about to jump from the side of the boat. Horrified, he directed how I was to go in from the back, dead centre. Crouched like a frog, with nothing but my underpants on, on a busy river in such a town, I was feeling quite bemused. Following a reluctant, swift nod from Chris, I rolled in, pleased at not finding him pulled in with me. ‘The Neckar, despite its refreshing coolness, was quite opaque – just a rather thick green. But the cold water running through my hair was a pleasant experience. I swam back to the stern of the boat and rested, kicking contentedly underneath. Chris and I shortly conversed before I powerfully pushed off, setting the boat, and a surprised Chris, racing a few feet before settling down to a drift. I surfaced and trod water, amazed at how far away Chris was. The bugger’s left me, I thought, before being gripped by a worry that I did not have the energy to swim that far. That evening, we went to a disco at the youth hostel, where I danced enthusiastically to Yes Sir, I Can Boogie and Jungle Rock. ‘On the final beat, as I stylishly slid to the ground, throwing back my sweaty hair, I was actually applauded. A small moment of glory, of sheer extrovertism.’ Remember – this was my own teenage diary. Modesty didn’t come into it. We nearly ran out of money the following day – a Sunday, with no banks open – and we were low on food. We finally found a bureau de change offering an exorbitant exchange rate but we had no choice. 2013: Mandy persuaded me I should not repeat my swim in the Neckar – to be honest, it didn’t look half as inviting anyway. And, instead of pushing bicycles up the steep ascent to the castle, we went by coach, seeing once again the giant wine barrel in the cellar. And no dancing, sweaty or otherwise, this time. ‘We rebelled against going home, back to bloody routine, even back to our families and friends – all these we would sacrifice to prolong this holiday. Why did we have to go home? In Karlsruhe, we saw the James Bond film The Spy That Loved Me – and were the only ones in the audience who cheered when 007’s parachute opened to display a Union flag. Our reluctance to leave may have partly explained why we nearly missed the train back to Heidelberg the next morning and the onward connections to Cologne and Ostend. 1977: Saying goodbye at Epsom station in Surrey: ‘”Farewell, Chris”, I called and proudly lifted my bike on to the platform. The place was still. Outside, I lit the lights and rode speedily home, the familiar streets welcoming, spurring me to ever more velocity. Was it just the wind that brought a tear to my eye? ‘I had experienced a holiday which was not only to change my opinions of Germany, nor of cycling, nor just of holidaying, but my outlook on life. My horizons were broader, my knowledge that much deeper. ‘It would not have been possible without Chris. A better friend, a more suited companion, I could not have hoped for. I am so glad he was as foolish as I to go on this trip. 2013: Reading my 1977 diary as we travelled serenely along the Rhine by longship, those memories came flooding back. The experience reminded me just how far I had come since those teenage days. This entry was posted in General and tagged 1977, Basel, bicycle, Chris Moran, Cologne, cycling, Deutsches Eck, diary, Elvis, featured, Germany, Heidelberg, Kahlsruhe, Köln, Koblenz, Lorelei, Neckar, Rhine, Rudesheimer coffee, swimming, teenager, train, underpants, Viking River Cruises, youth hostelling. Bookmark the permalink. Guest blog: A twentysomething on her first cruise with a family group of 12. So what did she make of MSC Fantasia?